We’ve had this Torta Verde, a rustic tart from Liguria, bookmarked for years, but were always hesitant to tackle it because of the dough. It’s meant to be rolled out paper thin, as if it were a sheet of pasta, then filled with a savory mix of chard, potatoes, feta and eggs. This was as much a way to make the flour go further as it was for its aesthetic appeal. It wasn’t until we came across a video of another version of this tart that we understood the dough’s particularly stretchy qualities, or, in baker-speak, it’s extensibility. With this in mind, we chose to use King Arthur’s Italian-Style flour for this torta. It’s an American version of what is known in Italy as 00 flour, and its low protein levels makes for a silky dough that is easy to shape, and bakes up light and tender. The dough will be easier to roll if you let it rest in the refrigerator for at least two hours, even better overnight. Traditionally, the torta should be even thinner than we’ve accomplished here — we’re still getting the hang of working with this supple dough. In keeping with this tart’s frugal origins, we used some leftover spinach in place of the chard; just make sure that whatever green you use is thoroughly drained. Though the torta was considered “poor people’s food in the Ligurian backcountry,” the delicious results are anything but. – To make dough: Mix together flour and salt in a large bowl. Drizzle oil into flour, mixing with a fork, then sprinkle in up to ½ cup water, 1 tablespoon at a time, mixing until dough just holds together. Knead dough until smooth and elastic, about 15 minutes. Shape dough into a ball, wrap or cover, and refrigerate for 2 hours, or overnight. – To make filling: Put chard into a colander, sprinkle with 1½ tablespoon salt, toss to mix, and set aside to drain for 20 minutes. Meanwhile, mix together potatoes, onions, parsley, and feta in a bowl, and season to taste with salt and pepper. Press chard against the colander to squeeze out juices, discard the juices and add chard to potato mixture. Mix in eggs and 2½ tablespoons oil and set aside. – Heat oven to 375°F. Roll out dough until 18″ in diameter, and place on a piece of parchment paper cut large enough to fit a 14″ pizza pan. Place the filling in the center of the dough, and spread to within several inches of the edge of the dough. Fold the edges of the dough over the filling and towards the center, forming overlapping pleats; gently press the tart to fill the edges. Slide the parchment paper with the tart onto the pizza pan, and lightly brush the edge of the crust with additional olive oil. Bake until golden, about 35 minutes. Adapted from “Saveur Cooks Authentic Italian” by the Editors of Saveur Magazine. Local ingredients: Spinach (in place of chard) from Hollister Family Farm; Yukon Gold potatoes from Riverside Farm; onions from Black Kettle Farm; feta from Flying Goat Farm; and eggs from Mona Farm. 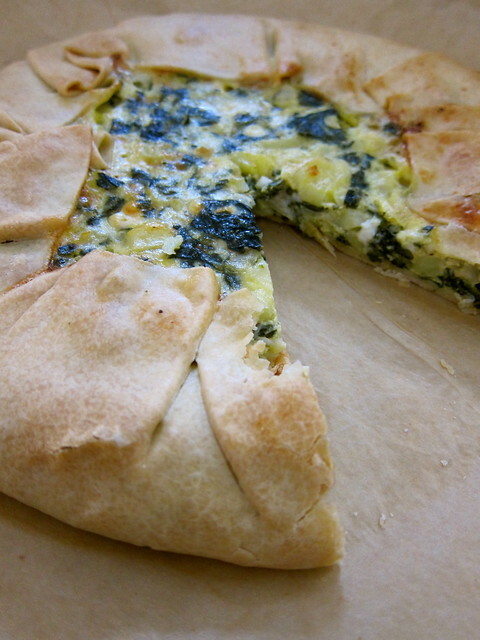 This entry was posted in cooking and tagged baking, chard, cheese, feta, potatoes, spinach, tart. Bookmark the permalink. Right up my alley. What an interesting dough. If I had greens, this would be tonight’s supper. I wonder if I could use broccoli…? Yum, Debra!! You’ve motivated me to use my own sack of 00. :) authorjane- absolutely. Finely chop and you’ll be in heaven. You might even consider swapping out your cheese. Maybe a nice local cheddar in lieu of feta? That’s just what I was thinking about both the treatment of the broccoli and the cheese. Off to make the dough now! Hope the recipe and variations worked out for the both of you! Gorgeous dish, very inspiring. We had a leek and mushroom frittata this morning, another great vegetarian dish. I had an old friend from Sicily who made chard and potato “pie.” It was pizza dough with a chard-potato filling, then topped with another layer of pizza dough, usually baked in a rectangular pan. I think he called them scotchatta, although that isn’t how it was spelled. Scociatta? Hi, Lou — Thanks for the Sicilian suggestion! Try looking up “scacciata,” it’s indeed similar. You can substitute swiss chard for kale and I also add some lentils. Great way to use up your parmesan rinds! And there’s no shortage of parmesan rinds to use up! This looks so delicious! Did you grow the chard and potatoes yourself? I’m going to try this but mix up the ingredients a bit. Thanks so much for sharing this! At this point in winter, we depend on our local farmers’ market to fill in for such things as chard and potatoes, and feel lucky that we can! Hope you enjoy the torta! We both seem to have a weakness for making tarts!